Trumpet man Wendell Cull(e)y (1906–1983) played in Lionel Hampton’s orchestra from 1944 to 1949, a period in which Milt Buckner was Hampton’s pianist. 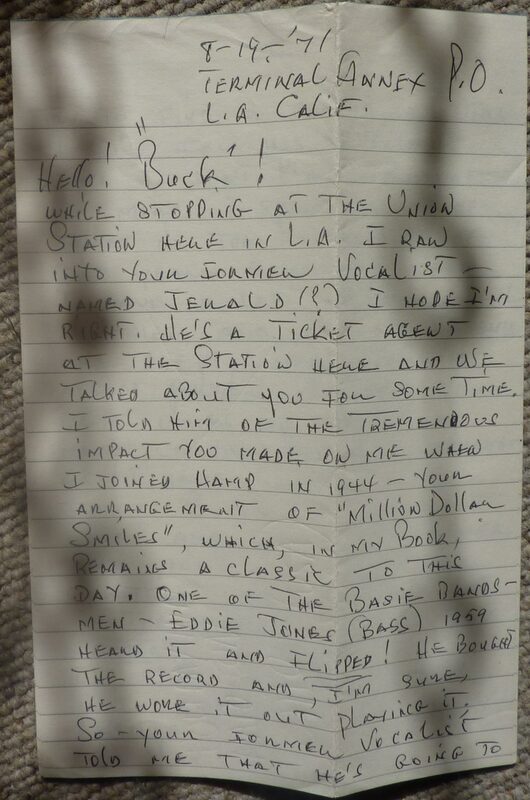 Culley (as his name is mostly written) and Buckner seem to have kept in contact over the years. 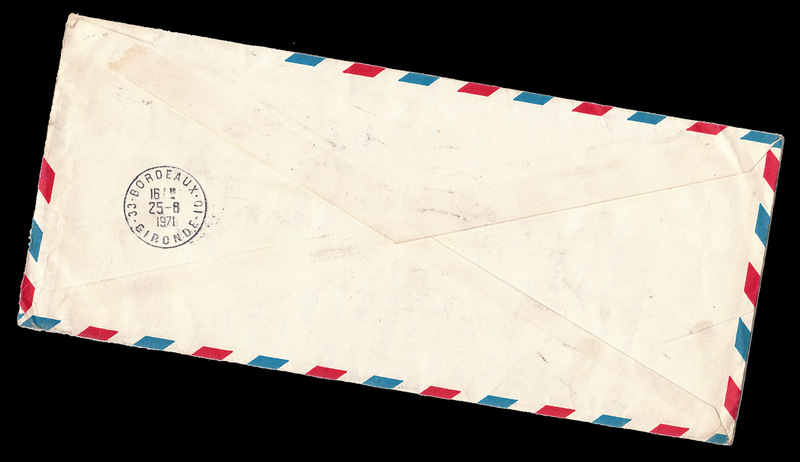 There is a letter in Otto Flückiger’s files about Milt Buckner that Culley wrote to Buckner in August 1971 (the letter arrived after a longer journey). We got Dinah Washington out of Chicago where she was singing with a church group. Sometimes she was singing there in a club. Hamp heard her somewhere, and before I knew it, she was in the band. 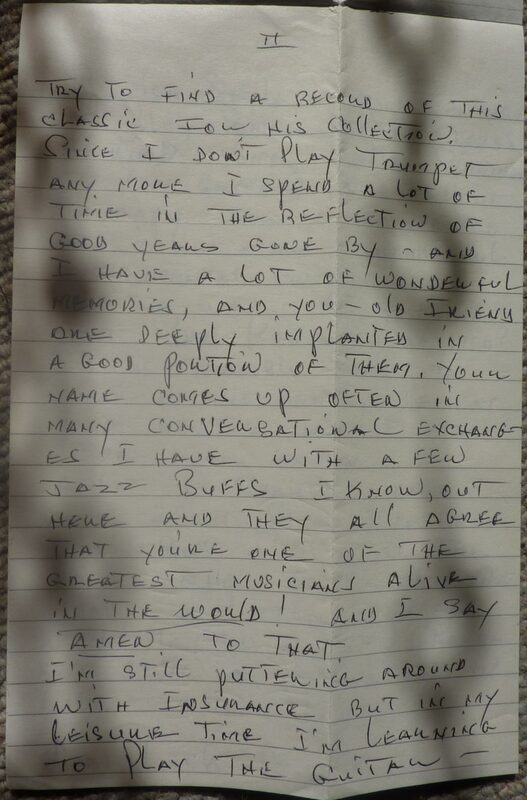 I made about all the arrangements for her in Hamp’s band, the first I made was My Bill. I always liked her voice. Gladys Hampton always tried to teach Dinah how to dress. You might remember Million Dollar Smile. I wrote that arrangement so that Dinah could sing it. We got into the Decca studio in Hollywood and we played the thing down and she sang beautifully. Hamp said: ‘Listen, Buck, there should be no singing on this arrangement!’. This Million Dollar Smile was one of the best records Hamp ever made, because of the sound. The guy that wrote this tune is Porter Roberts. He wrote for a little newspaper in Toledo, Ohio and he is still living there [Buckner was talking in 1975]. Before I came over here, I talked to him on the phone. I once made a deposition for Porter Roberts in Toledo in the 1950s against Lionel Hampton to describe the scene where Hapmton canceled the vocals. Well Dinah sat there and cried on that deposition and Roberts used it in a trial against Hampton. He was sure that the song was supposed to be a hit. He was sueing on the possibility that his song would have become a hit if Dinah would have sung on it. 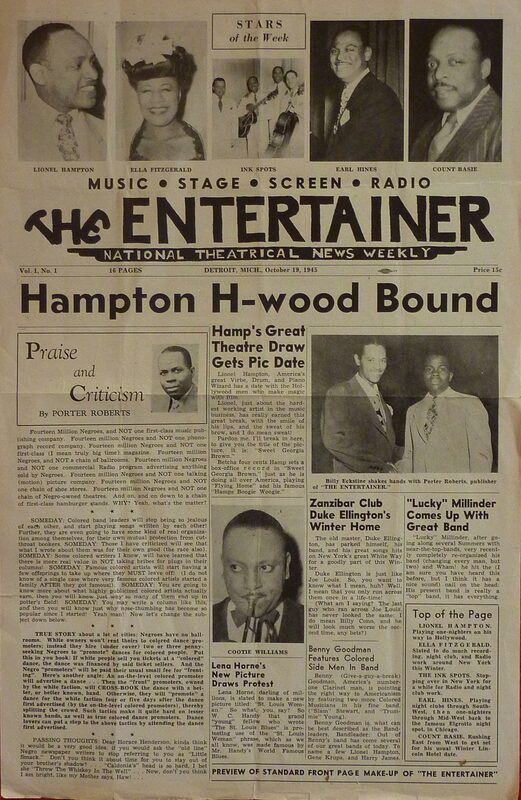 Composer Sues Hampton For “Violating” Song Pact Bandleader Lionel Hampton was sued in Toledo for failing to keep an agreement to record and publish a song titled Your Million-Dollar Smile (sic!). The action was filed by Porter Roberts, who contended he composed the tune and registered it for copyright, then gave half interest to Hampton. He claims Hampton promised to record and publish the song through his firm, Swing and Tempo Music Co., with profits to be equally shared. I could not find out what the result of this legal hassles were (and I would like to know the publisher and composer credits on the original 78). But if you listen to the arrangement of Million Dollar Smile featuring Dinah Washington – recorded for the Jubilee series – you can in no way doubt its great potential for becoming a hit. 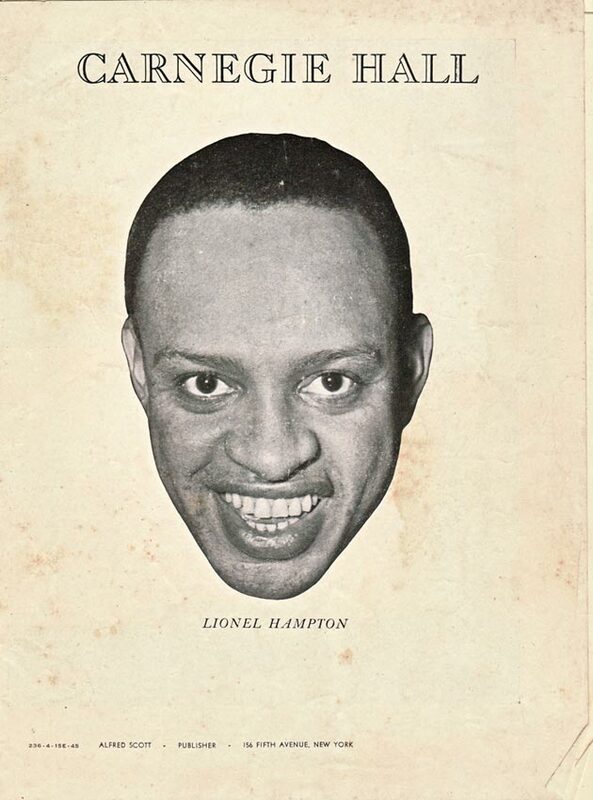 Lionel Hampton: Million Dollar Smile (Jubilee, recorded summer 1944) There are not many sources on the internet that mention Porter Roberts, but it looks like Roberts was a very interesting person. In the thirties (exact date unknown) he had a column called “Praise And Criticism” in the Pittsburgh Courier, in the fourties this column probably appeared in the Chicago Defender. Roberts probably had his home base in Detroit in 1945, because that is the place where he started “The Entertainer”, a magazine which was to supply “National Theatrical News Weekly”. In Otto Flückiger’s archives I found a copy of “The Entertainer’s” pilot issue. This is just a one-pager – on the flip there is just a list (how much advertising in future issues will cost). Read the fierce editorial – also named “Praise And Criticism” here – Roberts is not holding anything back. 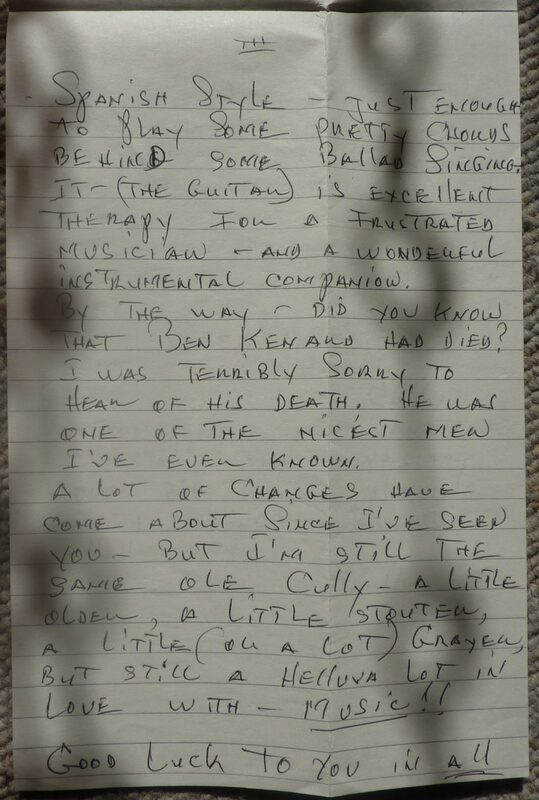 If Wendell Culley indeed writes about multiinstrumentalist Ben Kynard here, he was misinformed about this supposedly early death. Kynard, (pictured above in an undated, unsigned photograph) the alleged composer of famous tune “Red Top” passed on July 5th 2012, aged 92. Kynard had played with Hampton from 1946–1953. In the P.S. 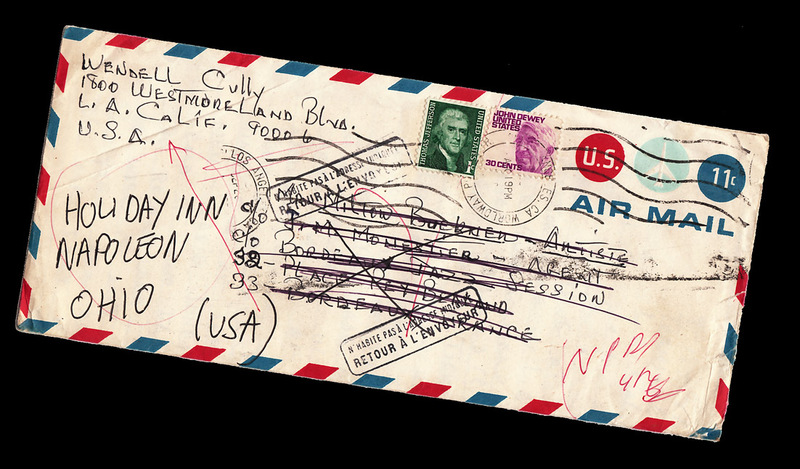 of his letter, Wendell Culley (as his name is mostly written – but note the signature!) 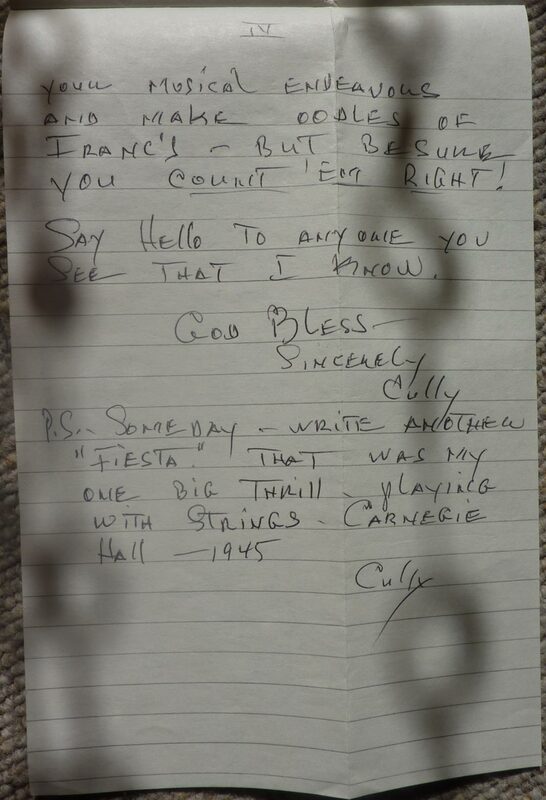 mentions Milt Buckner’s “Fiesta” in Carnegîe Hall 1945. This most probably is “Fiesta de l’Amour” [sic!] a “semi-classical” piece Buckner wrote in the mid-fourties. He had copyrighted it on January 23, 1945 along with seven other compositions that apparently never were recorded. 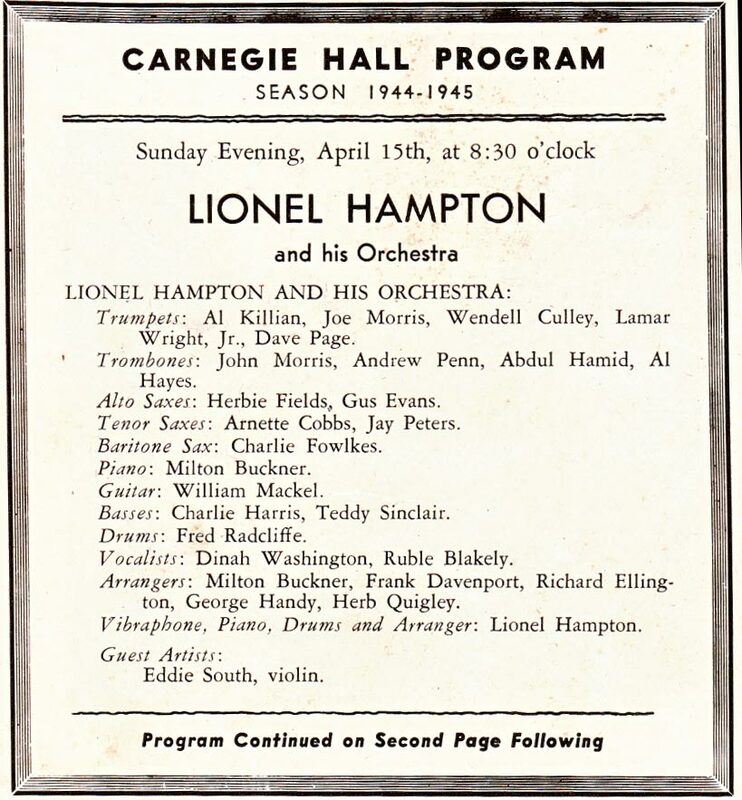 The program for Hampton’s 1945 Carnegie Hall Concert on April 15th (front pictured above) unfortunately does not mention “Fiesta” among the compositions to be played: As you see, “Carnegie Special”, “Where Or When” and Herb Quigley’s composition “Three Minutes With Three Notes” were the compositions played with strings featured. The members of the string section are not known, since the program only mentions Eddie South: So did Hampton change his mind and have the band with the string section play Buckner’s “Fiesta”? It will be hard to find the exact truth. 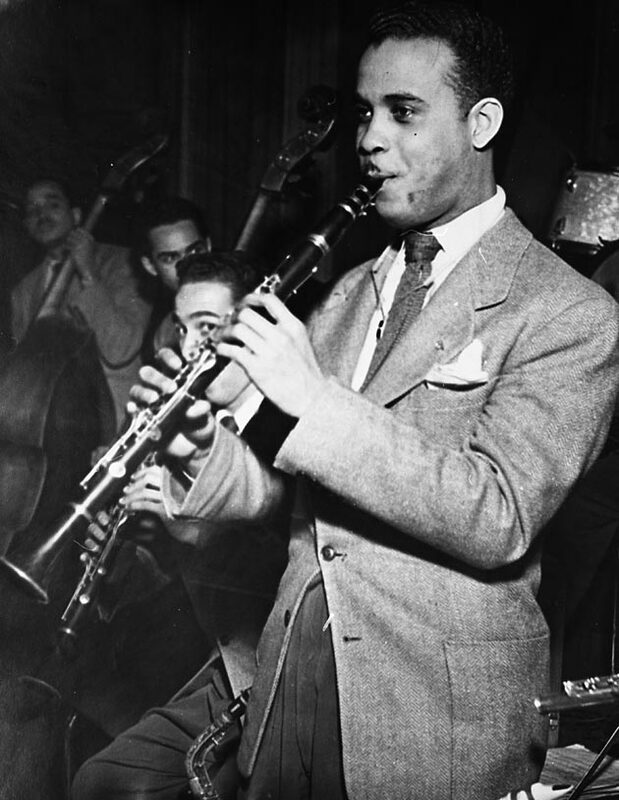 Although no recording of “Fiesta” as played by the Lionel Hampton orchestra at the Carnegie Hall is extant, “Fiesta de l’Amor” can be heard on a very rare recording by Milt Buckner’s Orchestra from a “Band For Bonds” broadcast recorded two weeks after Buckner’s first session for MGM in March 1949. 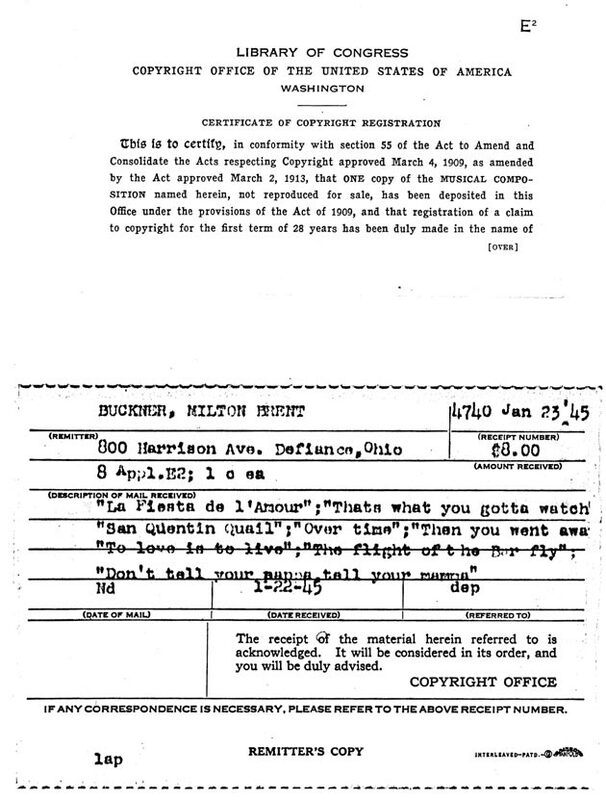 The broadcast (details in my Milt Buckner discography) was preserved on glass-based acetate records that were in Milt Buckner’s personal collection. It is not known what became of these glass records, but fortunately Kees Bakker or Otto Flückiger had the opportunity to dub them sometime in the 1970s. 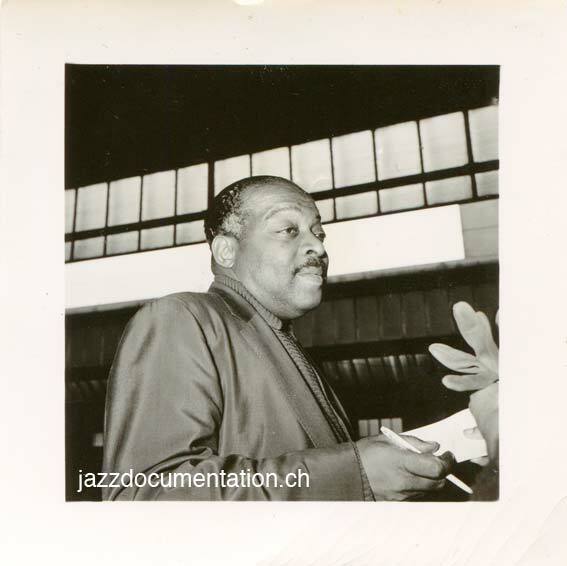 Milt Buckner and his Orchestra: “Fiesta de l’Amour” (“Bands For Bonds” broadcast, recorded probably March 26, 1949) This version has no strings but nice parts for Milt Buckner on vibraphone and unaccompanied Julius Watkins on french horn. Enjoy! UPDATE (August 19, 2012): The handwriting on the Srand Theatre photograph is not by Otto Flückiger, but by Milt Buckner (see comments section). 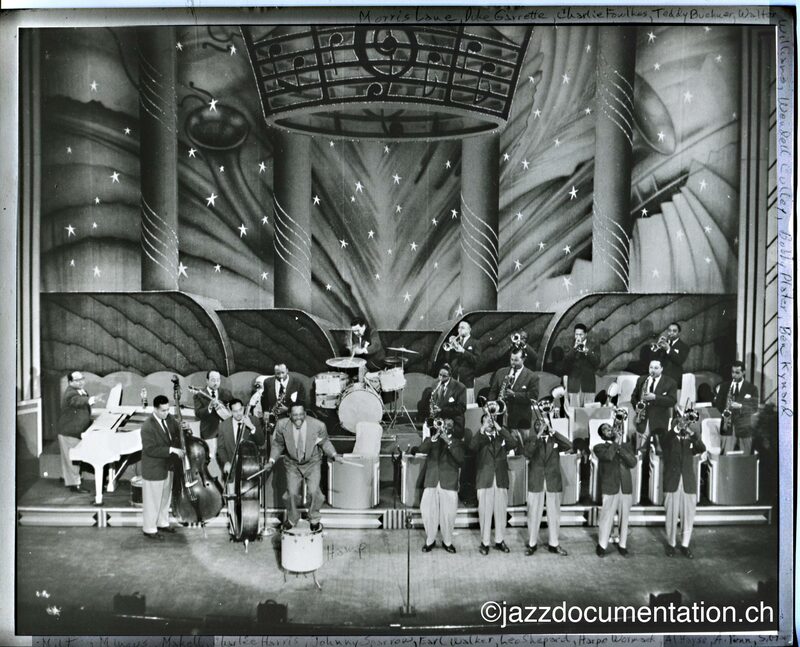 When I was down at the archives last week looking for documents in relation to Don Redman’s 1946 tour, I accidentally found a batch of gorgeous photos of Lionel Hampton’s band in 1948 and 1949 at New York’s Strand Theatre as well as from the Howard Theatre Washington 1948.